Gap EA is an automated trading system, which uses regularities of a price gap closing. It is known that in about 90% of cases the gaps are likely to close, i.e. the price almost always approaches to the close price of the previous bar. The Expert Advisor utilizes this principle. 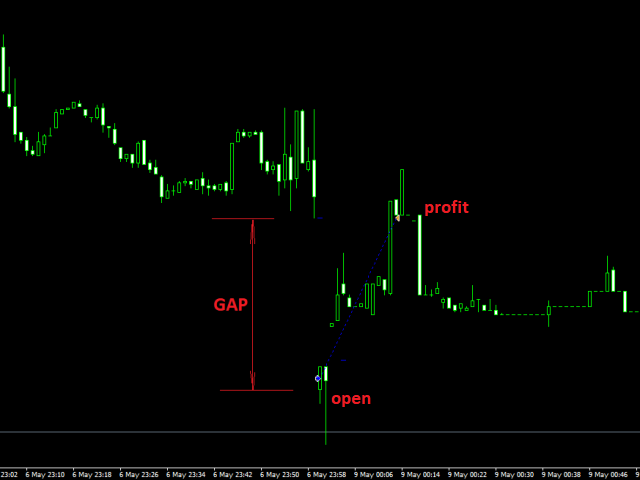 The robot tracks the gap and places an order with a take profit at the extreme of the gap, with a small stop loss. The trading robot can be used on any accounts with any leverage. The robot should be used on accounts with the minimum possible spread. If possible, use a broker with a fixed spread. In case of floating spread, set the Spread parameter to a value not smaller than minimum spread of a given account. Important! Be sure to optimize the Expert Advisor before using it on a live account!